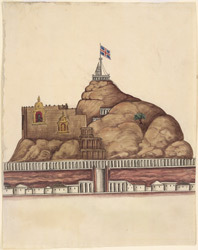 Watercolour drawing of the Rock at Trichinopoly (Tiruchchirapalli) by an anonymous artist working in the Trichinopoly style, c.1820-30. Tiruchchirappalli was an important Hindu centre since before the Chola period and it remained this way until the 17th century, then under the Madurai Nayakas. The town is situated on the Kaveri River and is dominated by a granite rock rising 83 m over the town. On the summit of the rock there is a Nayaka fort, a recent Ganesha temple and halfway up there are two small cave temples built by the Pallavas. Only a fragment of the great Nayaka fort remains, built on a circular plan with a ring of walls. Three kilometres north of the city, on the island of Srirangam, there are the two large Hindu temple complexes: the Ranganatha and Jambukeshvara temples. This drawing shows a Union Jack flying on the temple at the summit, with the fort to the left.